The fresh new 2016 HAPPY PILL is here to cure whatever ails you! With a brand new modern construction that is lighter and stronger, this updated version of our most popular surfer is guaranteed to make that perma-grin even wider! The full, round shape makes the board stable and because the board is ridden much shorter than a normal board, it maneuvers on a dime. Snappy turns, airs, and even toes on the noes are possible on the HAPPY PILL! Compression Construction Durable Outer top and bottom skin is compression molded for tight bond and closed off seam. CNC Core CNC machined EPS core, lightweight and high strength, creating a unique board feel. 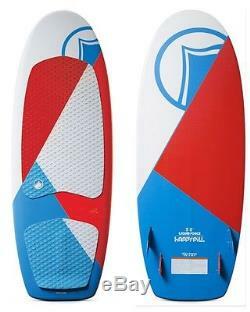 Short, stubby Squaretail Shape Full volume outline allows you to ride a smaller sized board. Single-to-Double Concave Hull Efficient flow and effortless glide. Quad Fin Set-Up 4 fin box set up, ships with two side fins and two nub fins. Ride as a quad or a twin. Front and Rear EVA Grooved Traction with Kick stops Lock your back foot against the rear wedge for ultimate control and grip. 48.4 122.8 cm. 19.0 48.3 cm. 2.5" N/0.7" T 6.4 N/1.8 cm T. Up to 150 lbs Up to 68 kg. 53.3 135.5 cm. 19.7 50.0 cm. 2.8" N/0.8" T 7.1 N/2.0 cm T. Up to 185 lbs Up to 84 kg. 58.3 148.1 cm. 20.5 52.1 cm. 3.0" N/0.9" T 7.7 N/2.1 cm T. 170 - 220 lbs 77 - 100 kg. 62.4 158.6 cm. 20.7 52.5 cm. 3.3" N/0.9" T 8.4 N/2.2 cm T. 190 - 250+ lbs 86 - 114+ kg. The item "Liquid Force Happy Pill Waksurfer" is in sale since Wednesday, August 03, 2016.